Hibs are running the rule over Canadian trialist Kosovar Sadiki after the player appeared in Monday’s reserve game against Falkirk. The 6ft 4in centre-back is said to have impressed in the 1-1 draw with manager Neil Lennnon in attendance, according to the Scottish Sun. Born in Germany, Sadiki moved to Canada when he was still a baby and would grow to become a under-23 internationalist for Les Rouges. He has been without a club since leaving Lokomotive Zagreb this past summer. 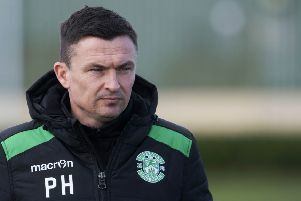 Hibs are fairly well stocked at the centre-back position with youngster Ryan Porteous emerging as a challenger to Efe Ambrose, Paul Hanlon and Darren McGregor, while Mark Milligan can fill in at the back-line also. However, both McGregor and Ambrose are out of contract at the end of the season.